✪Vertical takeoff and land, no need for runway. ✪Strong EPP material which is anti-crash. 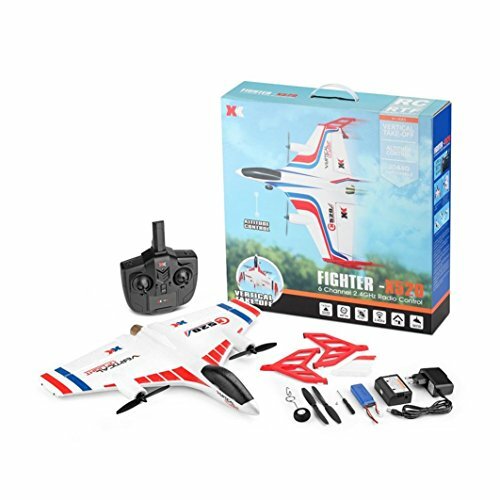 ✪3D / 6G mode, 3D mode for aerobatic fun fly and 6G mode for stabilized flight easy for beginner. ✪Equipped with 2 pcs powerful 1307 brushless motor with high power and great performance. ✪High quality advanced 2.4G remote controller with 150m control range. ❤~❤3D / 6G mode, 3D mode for aerobatic fun fly and 6G mode for stabilized flight easy for beginner. Equipped with 2 pcs powerful 1307 brushless motor with high power and great performance. High quality advanced 2.4G remote controller with 150m control range. ❤~❤1) Indoor vertical fixed-height flight mode, the aircraft can fly vertically like a quadcopter and a helicopter. Hover flight and forward and backward, left and right side fly and spin flight, and a one-button take-off/one-button landing function. ❤~❤2) Outdoor 6G leveling mode. The aircraft takes off vertically, and the one-key conversion level flight enters the 6G fixed height self-stabilization mode, achieving vertical flight to horizontal flight seamless docking, gyroscope self-stabilization, heading lock, which is very suitable for beginner fixed-wing mode practice flight. ❤~❤3) Outdoor stunt mode, after the aircraft has airborne horizontal flight, the switch switches to the 3D position, and the aircraft enters the 3D stunt mode (3D lock mode), making it easy to make a stunt action such as a tendon roll and a death spiral. ❤~❤There might be some deviation due to manual measurement.Any problem,Please feel free to contact us, we promise will try our best to help you. This Airplane was Sold By Lywey,Please do not buy it from other fake seller. View More In Gag Toys & Practical Jokes. If you have any questions about this product by Lywey, contact us by completing and submitting the form below. If you are looking for a specif part number, please include it with your message.